Pilots for 9/11 Truth, an ad-hock international organization of pilots and aviation professionals, petitioned the National Transportation and Safety Board (NTSB) via the Freedom of Information Act to obtain their 2002 report, Ã¢Â€ÂœFlight Path Study-American Airlines Flight 77Ã¢Â€Â³, consisting of a Comma Separated Value (CSV) file and Flight Path Animation, allegedly derived from Flight 77Ã¢Â€Â™s Flight Data Recorder (FDR). The 9/11 Commission relied heavily upon and frequently sited the NTSB Flight Path Study in their Final Report.In August, 2006, members of Pilots for 9/11 Truth received these documents from the NTSB and began a close analysis of the data they contain. 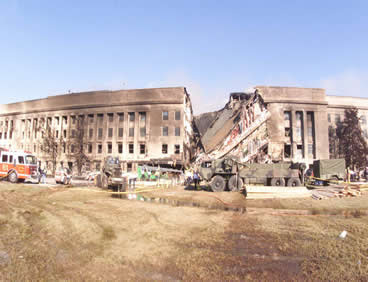 After expert review and cross check, Pilots for 9/11 Truth has concluded that the information in these NTSB documents does not support, and in some instances factually contradicts, the official government position that American Airlines Flight 77 struck the Pentagon on the morning of September 11, 2001. Altitude data from the FDR shows the aircraft on a different heading and at least 300 feet too high to have struck the light poles along Highway 37 moments before striking the Pentagon. The rate of descent data is in direct conflict with the aircraft being able to impact the light poles and be captured in the Dept of Defense Ã¢Â€Âœ5 FramesÃ¢Â€Â video of an aircraft traveling nearly parallel with the Pentagon lawn. The FDR record of data stops at least one second prior to official impact time, thus omitting crucial, final moment impact data. If data trends are continued from the last recorded, the aircraft altitude would have been at least 100 feet too high to have hit the Pentagon, even if it were on the correct path to also hit the light poles. An excellent lecture, summery and slide presentation by Calum Douglas, an engineering student at Oxford Brookes University and member of pilotsfor911truth.org was just put up on google video. So the pilots reading the 911 data say the flight data doesn’t add up. From my vantage point, the 911-Truth movement (negatively called “the conspiracy theorists’ movement”) has more scientific data and common sense on our side than the official government accounts. Polls show that most Americans believe as we do, that the true story hasn’t been told. If a presidential candidate stood up and said, “I will initiate a real investigation into exactly what happened on the day of Sept. 11, 2001 and the cover-up that followed,” he or she would immediately be the frontrunner. And then that candidate would probably be assassinated a week later.